My answer was yes (with the reservation that photos aren't definitive), and you know who I recommended: Sarah Canizzaro of Kojima Company. I know many other jewellers but no one with such a sublime pearl eye. 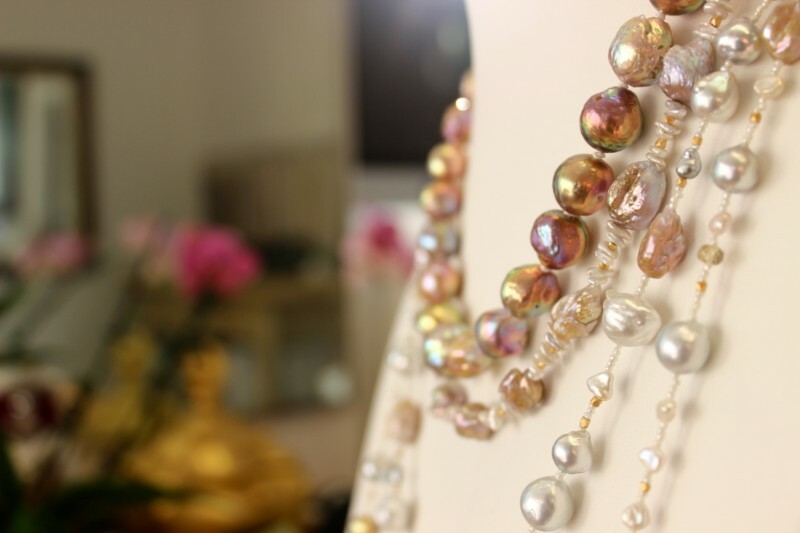 With all those pearls to work with, Adele could have a three-strand necklace that shows off the mix. You know how I go on about clasps! Sarah submitted four possible three-strand clasps to Adele. 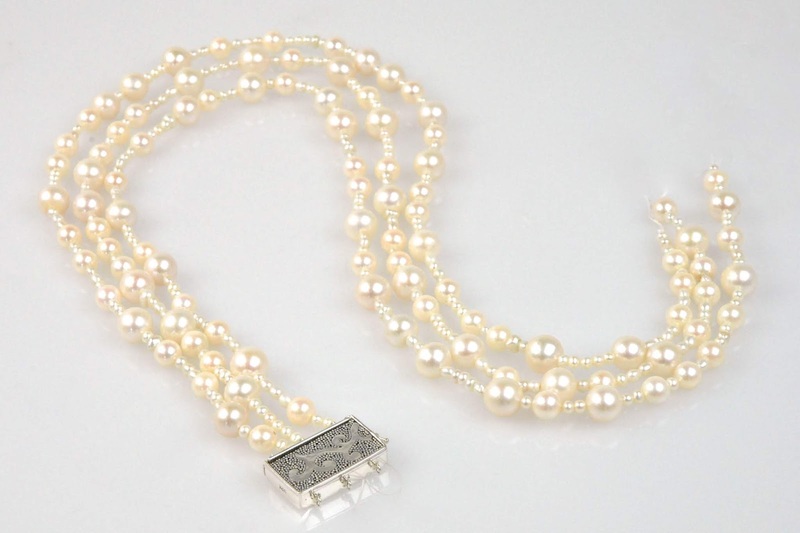 A triple strand box becomes an important element of the necklace because of its size, and I love them for that. Sarah also showed her a different three-strand style, the hammered silver hook closure at far right, which is useful if you want to adjust the length. Adele chose the granulated clasp at far left. Sarah knew Adele wanted a multi-strand piece, but had forgotten (jeweller hits forehead) that Adele told her she especially liked blackened silver, and wanted something "a little edgy". This piece uses those pearls beautifully, but it wasn't the mood Adele had asked for. I find the clasp a touch heavy for the composition. At this point, a designer of Sarah's calibre says, "Oh, right! Back to the table!" and a lesser one tries to talk you into it anyway. The second version delivered the attitude that Adele wanted, and suits her personality perfectly: look at that smile! Left: Adele off to work in her new necklace. Who could resist wearing it right away? Upper right: The clasp on the necklace; notice how the chain and black elements in the clasp relate. 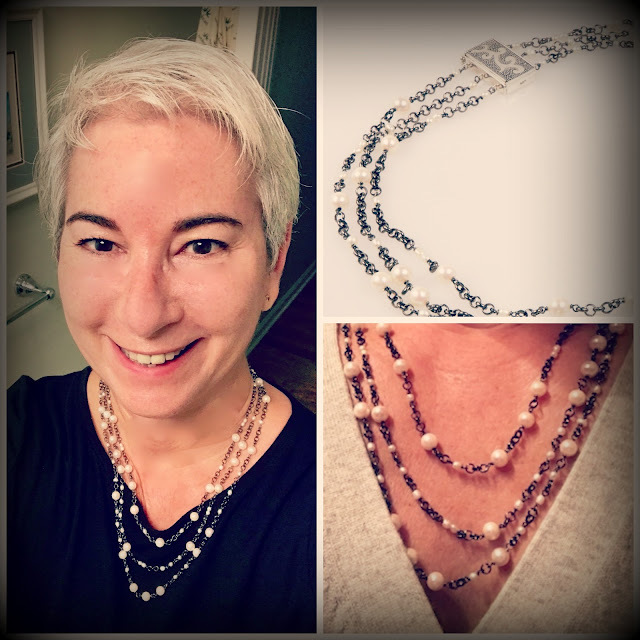 Bottom right: The necklace fills in a v-neck perfectly, and the pearls no longer look lost on a grown, effervescent woman. Beaders will notice there are fewer pearls in the funkier final version; Sarah made the leftover pearls into a bracelet for Adele. One more detail: the money. Adele built a kitty by selling unworn pieces on eBay. That's smart because she then knew her budget. You can go straight from the sale of old stuff to purchasing a new item, but when you reuse what you have, it's doubly pleasurable: savings and sentiment. The photo below is from Kojima: I wanted to show the varieties that could have nestled into Adele's piece if she had not had enough old pearls. If you have a sentimental strand of whites, adding only five or six different pearls (or more, yum!) and a new clasp will change your jewellery life! Adele has another project en train, and has graciously agreed to share it in the new year. But for now, her White Christmas has come early! What a perfect marriage of materials. Lovely. I agree that the new necklace is perfect for Adele. I really like the light and airy aspect which makes it very wearable. Thank you for sharing another successful Sarah project. Leslie: I was especially grateful that Adele showed us this one because there are no new pearls. She only added the clasp. While it is my idea of a really good time to shop for a sprinkling of new pearls when doing a reno this shows that it's not always necessary. But wait till you see what Adele's up to next! That is a lovely redo. As always your blog is so inspiring! Oh, just gorgeous - very chic! What an interesting reno this is. What a fabulous redo! It looks like something that goes with the person in the photo, and will be worn a great deal. Thanks so much for sharing my story -- and doing so far more articulately than I ever could have! Just wanted to add that I shared a lot of information with Sarah about how I wanted to wear the new necklace, and also sent her a photos of me at both my dressiest and my most casual, and that really helped inform the process. I was open to using additional pearls or accent beads from Kojima, but as she tweaked the work in progress, it became clear to both of us that nothing more would enhance the final product. Sarah was a dream to work with. 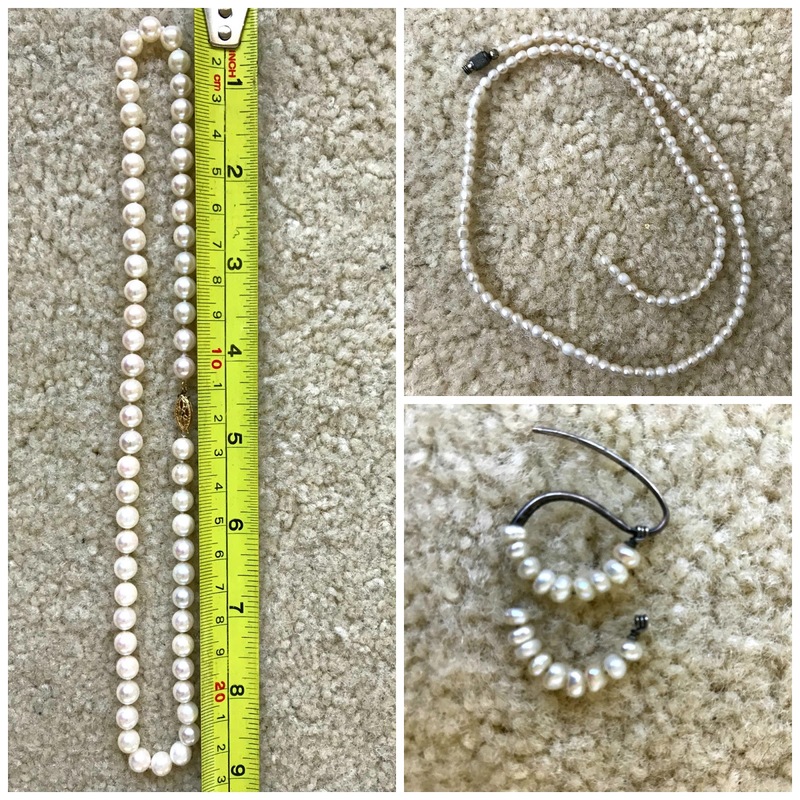 Oh, I do love the pearl posts! Just beautiful. Another Sarah fan. Have added to my pearl options each time Kojima has a sale. Current sale still on if you are tempted! Brava Adele. This is charming. Sarah is a wizard. Yes, it is lovely. I have the far more humble task of repurposing a short strand of pink coral my Mum gave me before the harm to coral reefs was known, or she would never had bought one. I'm searching for ideas to make it longer and less "pink", with semi-precious stones, good glass beads and silver ones. I have a background in fine arts, but not specifically jewellery making. Lagatta a Montreal, are you familiar with the Venetian jewelry making wizard, Marisa Convento, of the website Venetian Dreams? She does amazing work with beads, fashioning them into gorgeous coral shapes, and uses interesting Venetian glass beads as accent. I am sure you will find inspiration from her creations, or perhaps even work with her on a reno. That is a superb re-imagining. Suits Adele perfectly. I had hoped the Passage would become a site for sharing ideas and it's happening! Adèle, what an inspiration! No, I'm not familiar with Marisa Convento, but will be today! I happen to be translating a book by someone born and raised in Venice (from standard Italian, not Venetian dialect, though I do have some familiarity with the latter). Alas I don't think I have my Venetian glass bead necklace any more - I wore it a lot - it was shades of red. I'd love to go to Venice in the off-season (that means the colder months, but NOT Carnevale) as it is horribly thronged for several months a year. I went there for several day-trips when I was taking part in a seminar in nearby Udine, some 30 years ago. At the time, even in the spring, once away from San Marco there were many quiet places where families still lived, but I think most "normal Venetians" have moved to Mestre and other places on the mainland by now. Grazie mille, and as always, la Duchesse.